A landmark study helps explain why Big Pharma is so afraid of the medical benefits of cannabis. The pharmaceutical and alcohol industries, both powerful influences in Washington, have long lobbied against cannabis legalization in order to protect their profits. 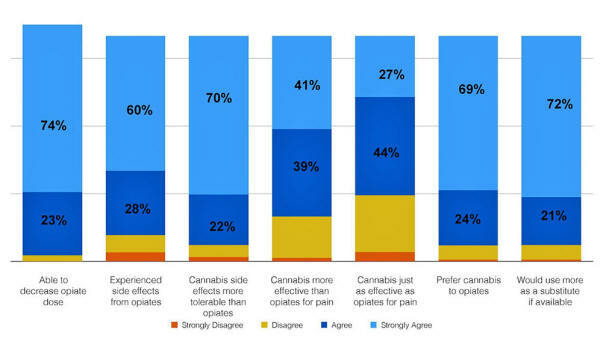 The recent study (Cannabis as a Substitute for Opioid-Based Pain Medication - Patient Self-Report) is lending credibility to the idea that medical cannabis can be used as a natural alternative to prescription pain medications, with nearly 100 percent of respondents saying they believe cannabis is helping them decrease their use of prescription opioids to treat the pain. The study, which was conducted by HelloMD, one of the largest medical cannabis communities in the nation, and University of California Berkley, surveyed nearly 3,000 patients who use both opioid and non-opioid based pain medication. While cannabis is only legalized for medicinal use in 26 states and the District of Columbia, 93 percent of respondents said they "strongly agreed/agreed" that they would use cannabis as a substitute for their current prescription medication if it was available. Dr. Perry Solomon, Chief Medical Officer of HelloMD, referenced a recent publication from the National Academy of Sciences, Engineering & Medicine on "The Health Effect of Cannabis and Cannabinoids," and noted that this study serves as a way to support the theory that cannabis is the opposite of a gateway drug. "The latest publication from the National Academy of Sciences clearly refuted the 'gateway drug' theory that using marijuana can lead to opioid addiction, instead finding evidence of cannabis having multiple curative benefits," Dr. Solomon said. "Our study further substantiates this. Hopefully this will awaken the public, medical professionals and legislatures to the fact that cannabis is a safe, non-addictive product, available to help fight the opioid epidemic." Amanda Reiman, a professor at UC Berkley who helped lead the study, said the treatment of pain has become a "politicized business" in the United States that has resulted in "the rapidly rising rate of opioid related overdoses and dependence." "Cannabis has been used throughout the world for thousands of years to treat pain and other physical and mental health conditions," Reiman said. "Patients have been telling us for decades that this practice is producing better outcomes than the use of opioid based medications. It's past time for the medical profession to get over their reefer madness and start working with the medical cannabis movement and industry to slow down the destruction being caused by the over prescribing and overuse of opioids." As we reported, despite the fact that cannabis has been proven to help with a number of things from killing cancer cells to treating rare and fatal conditions, it is still classified among the deadliest drugs that are supposed to have no medicinal value in the United States. While studies such as the latest one from HelloMD and UC Berkley serve as a reminder that for many patients, cannabis is the ideal alternative to opioid medications, there is still a clear reason why cannabis has yet to be legalized in the U.S.